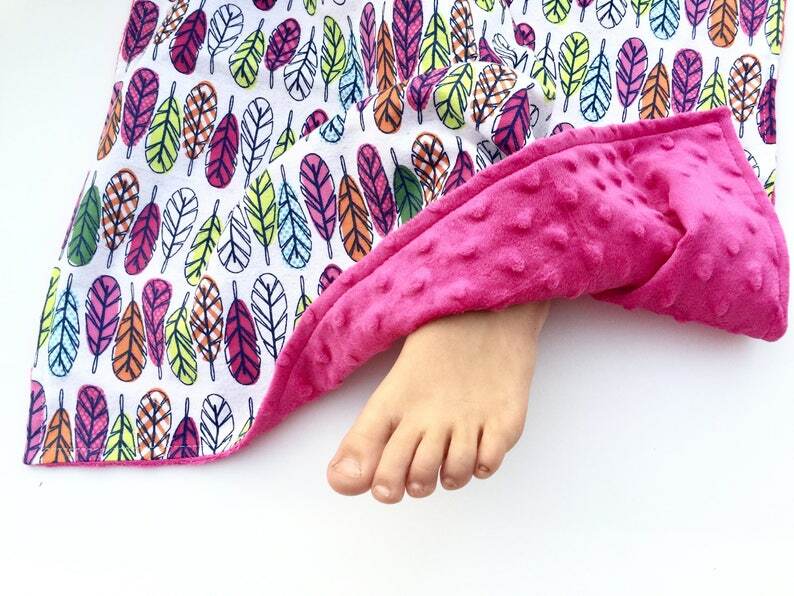 Cute, Cute Baby Girl Blanket! This blanket has colored feathers and is backed with hot pink minky. *** This blanket is 20.5" x 20.5" so it is best used as a carry-around blanket. My kids loved carrying these smaller blankets everywhere they went! It will partially cover your baby in a car seat, perfect to keep them warm and not too hot. This size would also be great to play with baby dolls and cover them up with. *** Blanket has top stitching to prevent the minky from shifting when washed. *** Made in a smoke free and pet free studio. *** Stock photo used. The cutting of the fabric may be a bit off due to being handmade especially for you. Great wrap. Love that it's reversible. Payment is due within 24 hours of purchase, otherwise, we reserve the right to cancel the order. Per state law, SewABC will charge sales tax for any buyers within North Carolina. All sales are final, with the exception of a defective item. In the rare event you should receive a faulty item, we'll offer you an exchange only (no refunds). We will take every measure to make the situation right for you by either fixing the faulty item, or creating a new one for you. Please note that the buyer will be responsible for all shipping fees associated with the purchase and return of the original item; however, SewABC will cover the shipping cost of the repaired and/or new item shipped back to you in exchange. Items eligible for an exchange must be shipped back to us within 7 days of your purchase date, and must be returned unused and clean. If you are planning an exchange, please contact us beforehand. We ship through the USPS, first class. We are happy to ship internationally. Please contact us for a quote.